Sherry Farra, associate professor and director of research in the College of Nursing and Health. The American Association of Colleges of Nursing has selected Wright State University nursing educator Sherry Farra to receive its prestigious AACN 2018-2019 Scholarship of Teaching and Learning Excellence Award. The award from the association, the accrediting body for nursing colleges, recognizes a member of the faculty of a member school who systematically investigates questions related to student learning and the conditions under which it occurs to improve outcomes. Farra is an associate professor in the College of Nursing and Health and the director of the National Disaster Health Course and the college’s director of research. She was one of only two recipients recognized nationally for this year’s award. “Dr. 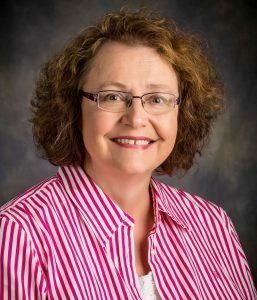 Farra is a leader in her area of expertise in nursing and nursing education, disaster nursing and committed to the discovery of new knowledge in the education of nurses as it relates to preparation through simulation and virtual reality,” one member of the association’s review committee wrote. Farra’s research trajectory is focused on methods of training to facilitate optimal learning outcomes. She led a federally funded research study of virtual reality training to prepare health care workers to evacuate newborns from an intensive care unit during an emergency. With Sherrill Smith, professor of nursing, Farra completed a study funded by the National League for Nursing to study virtual reality as a method for training nursing students for decontamination. Their research trajectory continues with a study funded by Sigma Theta Tau International to explore virtual reality compared to mannequin simulation for decontamination training. Farra grew up in Michigan and received her bachelor’s degree in nursing from Wayne State University. She obtained her master’s degree at Wright State as a clinical nurse specialist in adult health and her Ph.D. in nursing with a focus on scholarship of teaching and learning from the University of Cincinnati. Farra’s doctoral dissertation examined the effects of triage training on nursing students in Second Life, an online virtual world. Her study found that students who trained in Second Life retained information longer when compared to those who went through traditional learning methods. Farra is director for the National Disaster Health Course, an innovative disaster preparedness program for nursing students, working nurses, other health care professionals and first responders. Participants learn basic disaster life support, disaster leadership principles, first-aid, how to provide psychological support and how to prioritize injuries. In addition to teaching at Wright State, Farra is a research consultant to the chief nurse of the American Red Cross and is a board member for the Dayton Think Tank, a team of experts and community leaders formed to respond to disasters and emergencies.